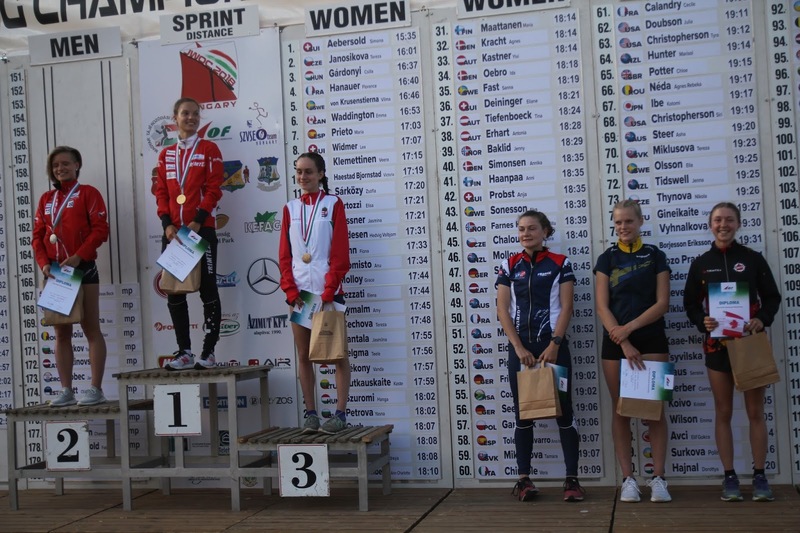 The first event of this year's Junior World Orienteering Championships in Hungary was the long, and it was really was long with the longest distances of any JWOC ever. This was due to the flat, open and very runnable terrain. 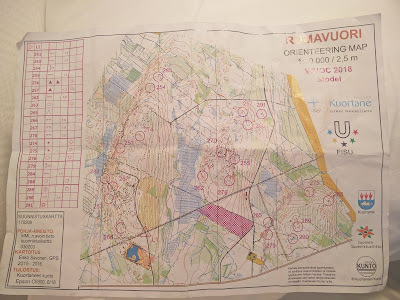 As this was my (Rachel) first JWOC I was a little nervous for the event especially the quarantine and extra long call-up and all of the extra stuff going on before the start of the race. 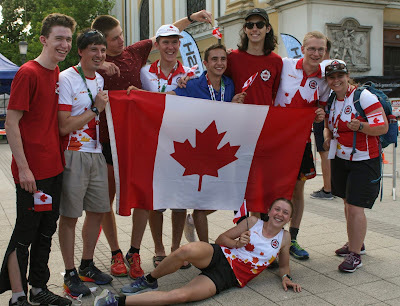 After the first control where I was a little flustered from being at my first Junior Worlds, I found a good flow and was really happy with the rest of my race. Thankfully, the weather wasn't so hot as the organizers had said it might be and was more like 26 degrees instead of 40 degrees. The terrain was a mix of planted forests in nice blocks and very open grasslands somewhat like Kamloops if it were squished so that the highest hills were only around 10 meters high. 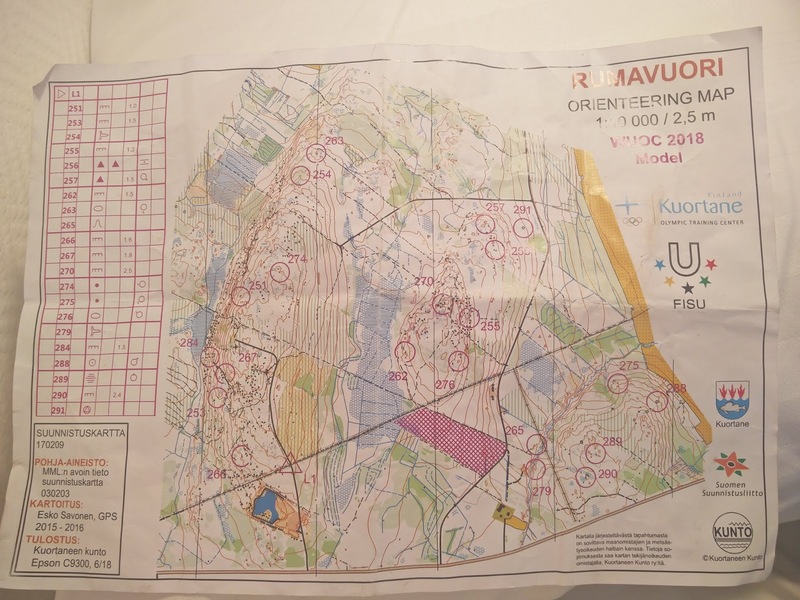 It made for orienteering where there was very limited route choice as going straight was almost always not only very possible but also the fastest option by far. The trails were also very sandy so did not make for fast running as one might expect based on Canadian orienteering. 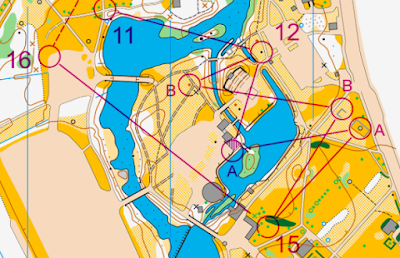 A map snippet of the middle of the W20 course. 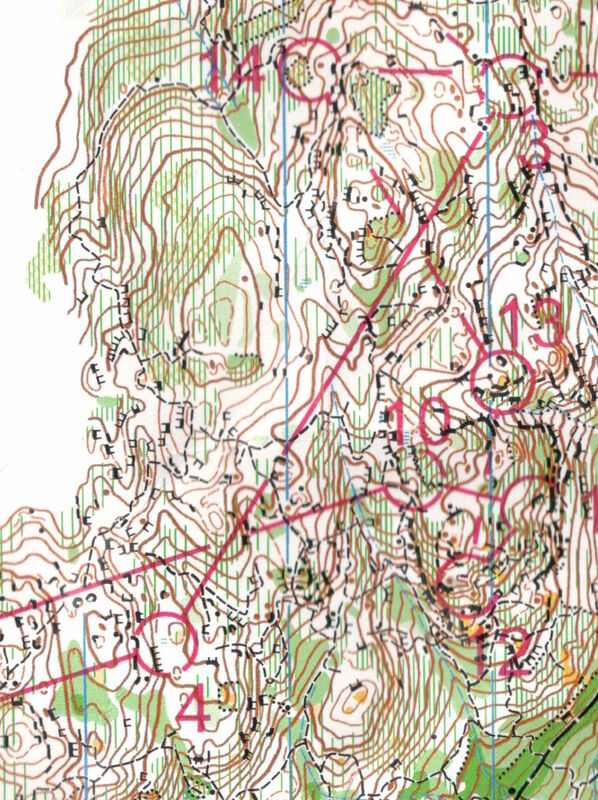 The leg from 3 to 4 was a long leg through the planted forests and out into the more open grasslands where as usual straight was the best option. Me and Jan with the old school results board in the background. Each athlete had a board that they then printed your time onto and slotted you into the correct spot. 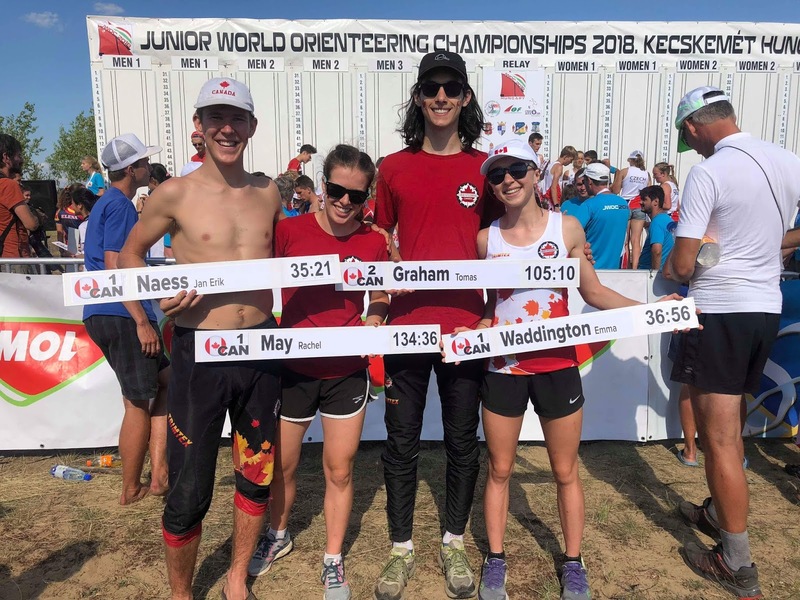 Our team's best placing of the day was Jan's 13th place (despite him being shown in 14th on the board) making it the best Canadian male result at the Junior World Orienteering Championships. The sprint wasn't the best race of the week for me as I mispunched when I didn't see a control and had the surprise of finding out that there had been a control number 15 that I had in fact not been to. This was overshadowed by cheering for and watching Emma to her 6th place finish. It was very exciting to have a Canadian as a part of the medal ceremony. Emma on the podium and a happy Canadian team. 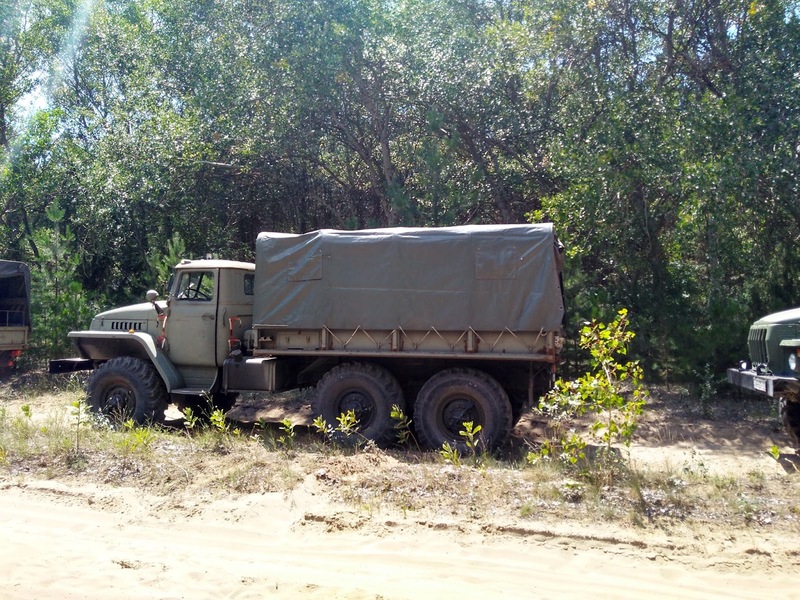 The middle had us taking military transport vehicles into a green maze of juniper bushes, for the final at least and a mix of juniper maze and open forest for the qualifier. As I found out, once you have lost your exact location in the maze of green it is very difficult to relocate without bailing, a sometimes difficult task when you are faced with what seems like no way out without bashing through thick bushes. The middle races were unpredictable with the green and the possibility of trapping yourself in the bushes by choosing the wrong macro route choice and mistakes very easily becoming major and very difficult to correct. 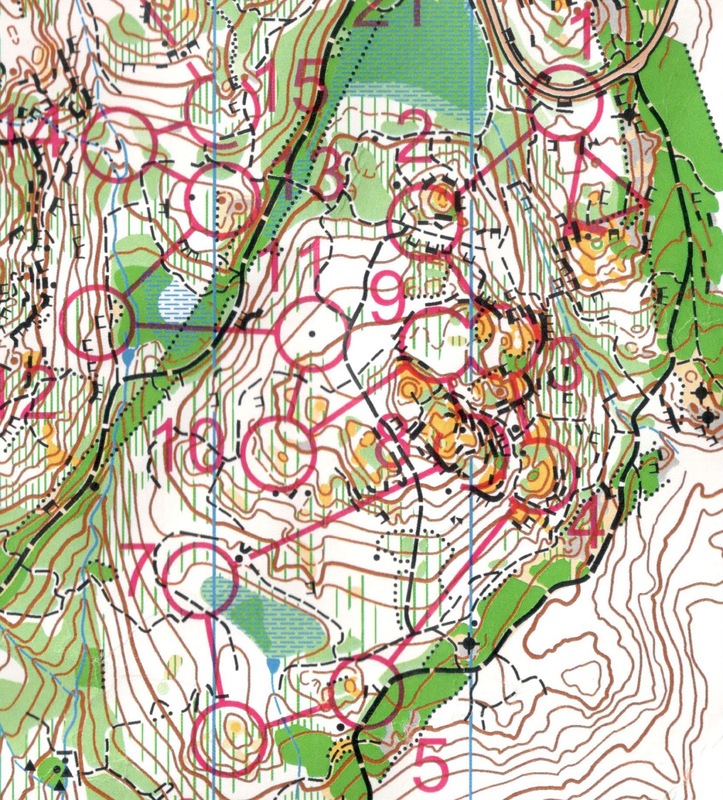 The final saw a Hungarian winner for the women so their training in similar terrain must have paid off as it makes sense in terrain so unique to the area. Although, I doubt the Swedes have similar terrain at home and the men swept the podium so it can't just be that. The military transport used to travel the last part of the drive to the middle and relay quarantines. The benches in the back were not padded and we were given dust masks by the organizers because of the amount of dust churned up by the trucks. 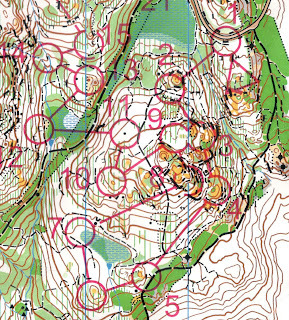 The last race for the week was the relay and took us back to semi-open terrain with fast running. It also brought the hottest day of the week. Even with dumping water on my head multiple times during my warm-up as well as during the race I dried off and was warm again with minutes. Many runners struggled with the heat losing focus and concentration as the race went on due to the heat and dehydration. I was running the third leg and it was cool to be able to see the runners coming through the stadium and cheer for my teammates as they went out on their legs. I ran alone for almost all of the race so I didn't have the excitement of running with a pack however there were elephant tracks through the grass and bushes in places that were helpful for getting through and knowing I was on the right track. I was really happy with my navigation and running in the relay and it was my best race of the week. The open grassland was more predictable and forgiving than the middle terrain and it was nice to be able to navigate at speed again. Emma running the first leg for the girls team. Following the awards ceremony we were able to collect our names from the results board to take home with us. It was a bit of a free for all as everyone ran up to search for their name. With our name boards after the relay. 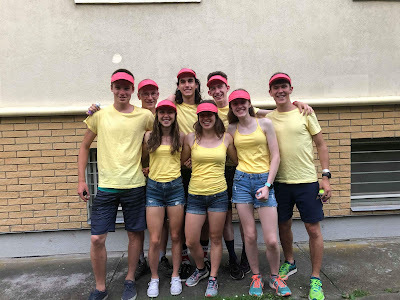 After the relay there was the banquet and the team was dressed up in matching outfits even if it we didn't have a specific costume or weren't dressed up as something. 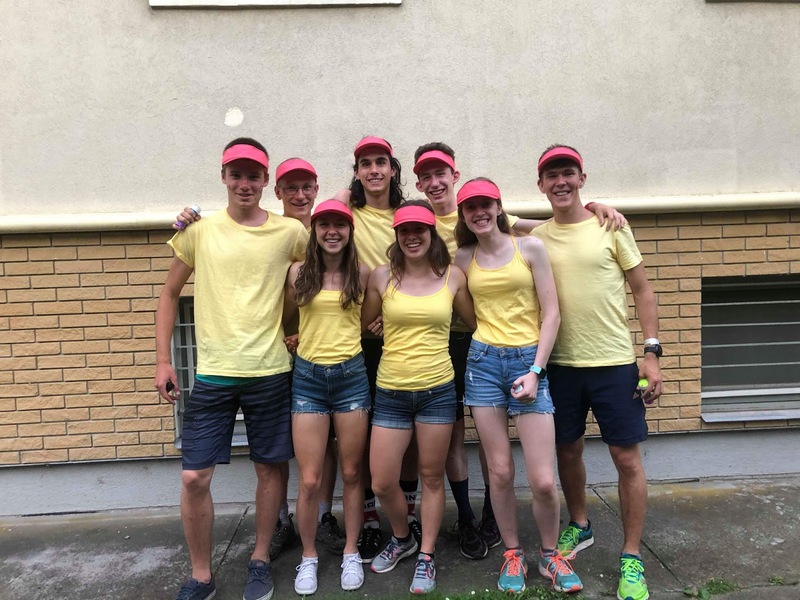 A big thanks to everyone who followed along with the team and our races at this years Junior World Orienteering Championships in Kecskemet, Hungary. Have you been inspired by our athletes racing at major international events this summer? Would you like to help support them? One of our major fundraisers each year is the Silent Auction. 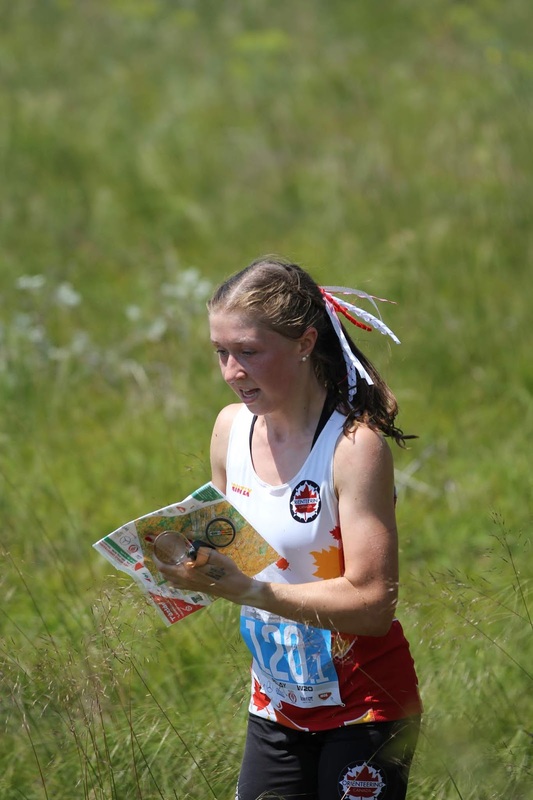 Every year the High Performance Program holds a silent auction fundraiser at the Canadian Orienteering Championships. This year the silent auction will be at the North American Orienteering Championship's banquet on Monday, August 20th in the Yukon. Members of the High Performance Program will be donating items, but we greatly rely on and appreciate donations from the Canadian orienteering community, their family and friends, and any out of country orienteers. If you have an item to donate, you can bring it with you to the Yukon or send it along with someone who is attending. If you know what you're bringing, you can email jamackeigan[at]hotmail[dot]com. We can do some promotion of the bigger ticket items and have an idea of how many items we will have to set-up. Donations can be left at package pick up. If you are coming to the NAOCs/COCs, please bid generously! Don’t forget your wallet and/or your cheque book. Cash or cheque is the preferred payment method, but we will be able to take credit cards. Those of you who have been to one before know that the Silent Auction is a lot of fun, often with frantic bidding as time runs out. You never know what the highly sought after items will be. And if you can’t make it to the Yukon this year, there is always the option of allowing a trusted friend to bid for you! Just give a budget limit and an idea of what you want. The HPP is very appreciative of all the support we receive and we look forward to seeing you in the Yukon! Second day of competition. Pia, Adam, Robbie, and myself (Tomas) were off to Virpimäki for the middle. We were spoiled with an unusually luxurious quarantine; a tiny storage warehouse scattered with open drums of chemicals, half-eaten sandwiches, and dead mice. The sun hadn’t let up so hydration was super important. The terrain consisted of medium hills covered with mossy rock faces, dried-up marshes, sparse boulders, and decently runnable forest broken up by large cut blocks. Looking back, I wasn’t super well prepared for this race. Not only was I still recovering physically from JWOC, the terrain and map were also a big change from Hungary. The forests were faster and the contours and rock features were much more subtle. On top of things, the thought of having a GPS to broadcast my every move was just a bit unhinging. Nevertheless, I went into it intending to get use to the new environment and enjoy the experience of running on Finnish soil for the first time. I had good flow going for the first half of my run. My bearings, however, were a bit off. Probably because I didn’t have the extensive visibility I did in Hungary. It was crucial to not get caught up looking for smaller features. The rock faces and marshes were useful even though the dryness and moss made them look pretty similar. At the start of the next half, I cut through a large patch of deadfall, and that’s when the heat and fatigue started to get the best of me, leading to some pretty embarrassing mistakes. All the Canadians were pretty pooped by the end of their runs. Pia’s race was unfortunately cut short by an injured ankle. In the end, we all had positives and negatives to take from our races and were looking ahead to the rest of the week. 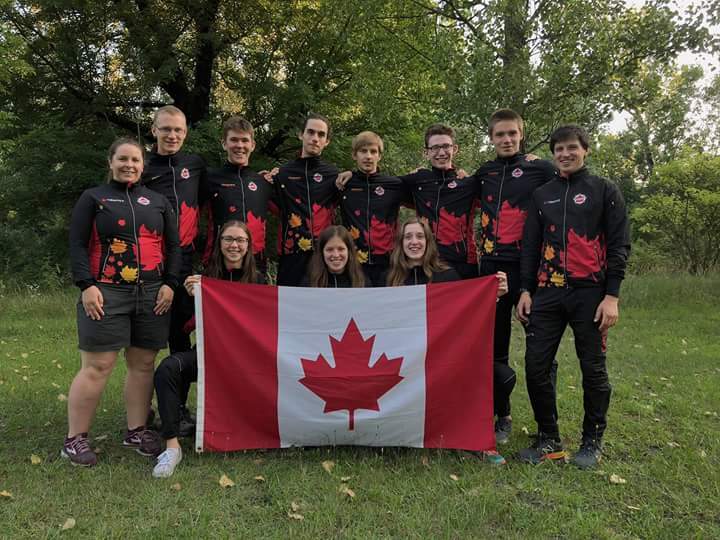 Team Canada has finally all arrived in the small lake-side village of Kuotane, Finland, and we are all gearing up for the first race tomorrow! We've been arriving steadily over the last few days, and with Emma and Tomas flying over fresh from JWOC, the team is complete. Unfortunately, Michael Svoboda injured his knee at JWOC, and so is unable to compete this year. We all wish him a swift recovery! Today, most spent the morning on the model map figuring out how things are mapped, and what the best strategies are. With temperatures hitting the 30s, most of the marshes are dried up, and the forest is mostly white, although hummocky underfoot. 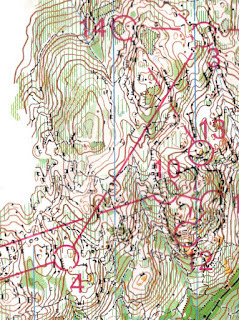 2.5m contours and rocks galore make for some wonderfully technical terrain that is also quite speedy. In the afternoon, Adam, Michael, Robbie, and Marg took the bus into Seinäjoki to check out the sprint relay and sprint areas, while Tomas, Emma, and I (Pia) inspected the terrain via google from our accommodation. Their return confirmed what we suspected - the sprints promise to be fast and flat, with a few more complicated bridge and housing-complex areas. Will Critchley and Graeme Rennie also dropped by on their way back home from the FIN 5, giving us insight into the terrain they had been running on, as it is adjacent to the middle. Finally, WUOC was declared open this evening at the opening ceremonies. 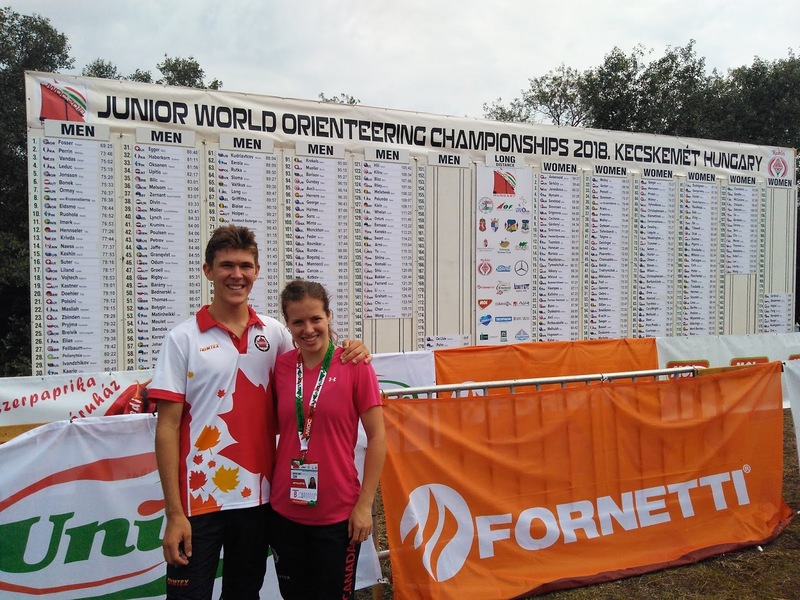 The Junior World Orienteering Championships (JWOC) are the first championship event of the summer! This year JWOC is in Hungary. We hope that you're getting excited to cheer our athletes on. Jeff Teutsch is the team coach and Meghan Rance is the team manager. Hungary is 9 hours ahead of Vancouver, BC (PST) or 6 hours ahead of Ottawa (EST). 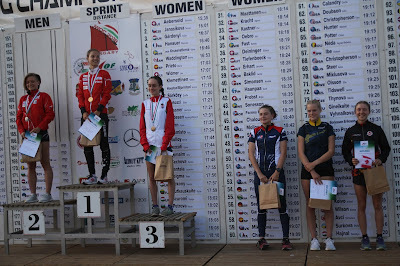 You can get live results on the JWOC website throughout the week. Although there is nothing up yet, World of O often has excellent coverage of the event and does super cool map analyses. 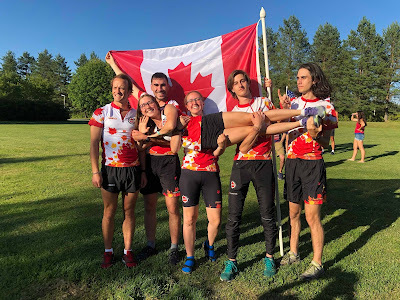 Stay tuned to this blog, Orienteering Canada's Facebook, and Orienteering Canada's Instagram for more updates through the week. Go Canada go!